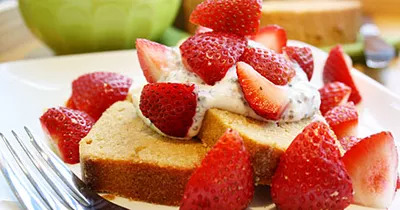 There's just something about summer that screams pound cake, berries, and whipped cream. Unfortunately, it's not often something we want to indulge in during the warmer months, given its propensity to be quite heavy. As a result, I took to the kitchen, determined to come up with a healthier version to enjoy guilt-free during these last few weeks of heat! Using this recipe for Ultimate Vanilla Pound Cake, try out the four simple tweaks I’ve detailed below, and in no time, you can have your cake and eat it too! 2 cups all-purpose flour — I used 1 cup all-purpose flour and 1 cup white whole-wheat flour to boost the fiber content. 1 1/2 cups sugar — I substituted 1 cup agave nectar here for a more natural sweetness. 5 large eggs, at room temperature — To cut down on cholesterol, I used 3 eggs and 1/3 cup egg whites.